I'm not quite sure when it happened, but somewhere (somehow) I developed a taste for tart foods. Traditionally, I'm a sweet and salty kind of gal, alternately loving the sweetness of a warm chocolate chip cookie and the crisp bite of a salty potato chip. These are the tastes I grew up with in the heart of the Midwest. Rarely a dinner table was without a half empty shaker of salt (the pepper stayed curiously optional), and the breakfast table looked scarce without a sugar bowl at the ready. Certainly sour and tart foods made an appearance, but they never stayed long enough to wash up at the sink and join me in the kitchen. It is difficult to mess with tradition, but if you push against it hard enough, you can make space for new ones. Last winter, I had a quiet affair with grapefruits and sour Greek yogurt. This summer I simply couldn't get enough lemonade. My palate is evolving, expanding to embrace the sour and tart flavors I've neglected for so many years. While just two years ago, these Cranberry Lemon Scones would have been far out of my comfort zone, today they feel like a natural extension of my growing affection for new tastes. The marriage of lemons and cranberries makes for a sharp and charming flavor profile. I like to imagine that my taste buds are finally growing up. The tartest of fruits reside in the winter months. In a way, I find it fitting. The berries have lost their allure, growing tarter with each passing day, and the bright flavors of fall have become subdued. It is time for the grapefruits, cranberries, and lemons to come out to play. The sharp taste of these fruits mimic the chill of the winter air, sweeping the taste buds like the rush of cool wind. In the dead of winter, when the sweet fruits of long summer days are but a fading memory, the contrast of the tart fruits of winter remind us of the changing of the seasons. 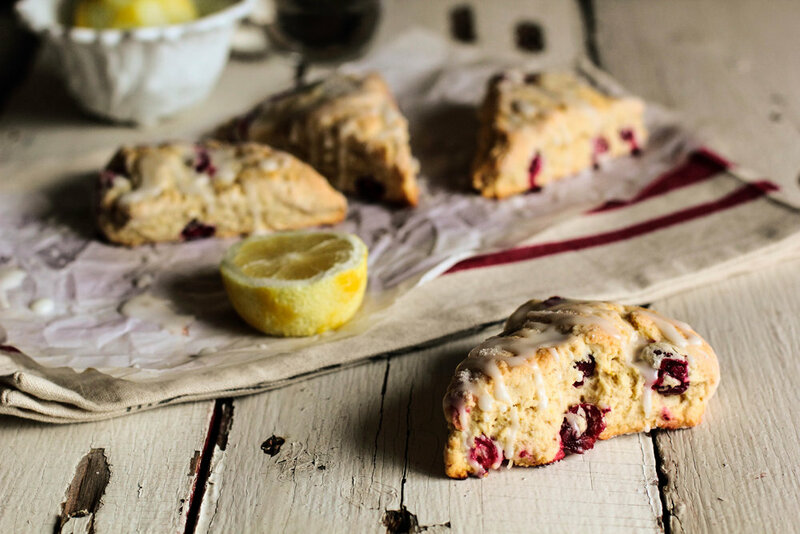 Lemon Cranberry Scones are delightfully tart. Scones are infused with lemon zest and riddled with cranberries. The dough is quite sweet, especially because the dough is sprinkled with sugar before baking. However, the bright, tart cranberries act as a strong contrast to the sweetness, rendering the scones both sweet and tart. A simple lemon glaze rounds the flavors together. Be warned, however. These scones are certainly not for everyone, but are wonderful for those with a tart palate. In a large bowl, whisk together the flour, sugar, baking powder, lemon zest, and salt. Using a pastry blender, cut in the butter until mixture resembles a coarse sand (alternatively, if using a stand mixer, mix in butter with paddle attachment until butter is pea-sized or smaller). Stir in the cranberries. In a small bowl, whisk together the heavy whipping cream, egg, and vanilla extract until well blended. Pour cream into scone mixture and mix until it comes together as a dough. A few of the cranberries may burst; this is okay. On a lightly floured surface, place dough and form into a circle, flattening the top until dough is roughly an inch thick. With a knife dipped into flour, cut dough into 8 pie-shaped pieces and transfer to a baking sheet. Sprinkle the tops with granulated sugar. Bake for 20-25 minutes, or until scones are lightly browned. Allow to cool to room temperature before glazing. In a small bowl, whisk together the powdered sugar and lemon juice until smooth. If glaze is too thick, add lemon juice 1 teaspoon at a time until glaze is thick, but still runs. Lightly drizzle glaze over scones and allow scones to sit for a few minutes for glaze to set before serving.